The St. Louis Blues continue their winning streak with five wins after beating the Oilers on Tuesday, January 13th. This streak is not the most exciting news for the Blues, however. These last two weeks have brought a few records and recognitions to St. Louis. Captain David Backes was named NHL’s No. 1 Star of the Week last week. He is now the fourth Blue Note in the last 14 weeks to win the award, which is twice as many as any other team in the league. Vladimir Tarasenko, Jori Lehtera and T.J. Oshie were the three previous winners. Backes has had five goals and three assists in the last three weeks, but like his other superstar teammates, he remains humble. Further, the players aren’t the only one’s breaking records. Head Coach, Ken Hitchcock received his 684th regular-season victory after the win against the Oilers on Tuesday. He is now tied with the recently passed Pat Quinn for No. 5 on the league’s all-time list. Hitchcock remained as humble as his players after receiving the honor. He praised Quinn for his ability to coach and manage better than anyone else in the league. Even with all this sweet success, a bit of sour creeps in. Martin Brodeur is taking a one-week leave of absence after an announcement was made Wednesday, January 14th. Not much was said by Hitchcock, other than Brodeur’s future with the Blues would be determined during that time. Brodeur’s people have made no comments. It’s a tough choice for the Blues and Marty. His career has been long and gratuitous, with his (most likely) best years spent with the New Jersey Devils. And yet, when the Blues desperately needed a little depth in goal when Elliott was injured, Brodeur was there to pick up the slack. He is less than ten games away from a major record and no one deserves it more. In my humble opinion, I would let Brodeur end his career on a high note, giving him those last few games to snag the game winning record and retire. 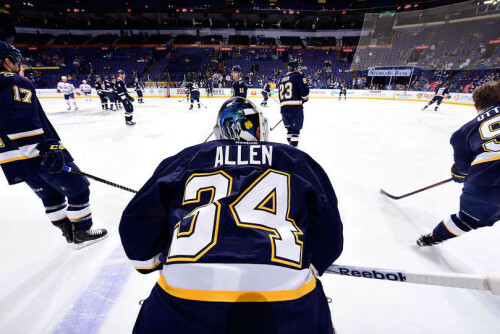 Jake Allen and Elliott have a long career with the Blues yet, both are strong goalies and only getting better. Fans of the Blues and nationwide fans of Brodeur will be waiting to hear when the decision comes. Until then, let’s hope the St. Louis Blues continue their winning streak and ability to break records!